Watch this short video from the Colorado Department of Human Services about the transformative process of Early Childhood Mental Health Consultation. 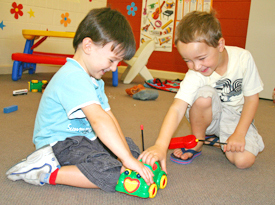 Using the strategies recommended in the EC CO Framework, MECC nurtures the social and emotional development of young children by promoting caregiver knowledge of social-emotional development, providing ECE professionals with effective practices and coaching, and supporting mental health services and consultation. For the past few years much of this work has been done through our Pyramid Model Partnership (PMP) Leadership Team, which developed and implemented an Action Plan in order to provide support and training to EC educators in our community. At least 90 local educators were trained in this important model designed to increase social-emotional competence in young children. To find out more about this work and our continuing efforts, click here. Beginning in Fall of 2013 and continuing into Spring of 2014, in lieu of the PMP training, MECC began offering the Incredible Years (IY) Teacher Classroom Management Program to preschool teachers. Taught by MECC’s Coordinator, Vangi McCoy (herself a former IY Coordinator), and Lindsay Sherman, the IY Coach for Invest in Kids, this evidenced-based program has several goals including: promoting positive relationships and social competence, increasing home-school collaboration, and decreasing conduct problems. We’ve recently hired a Social-Emotional Coach, Geof Byerly, to provide a variety of supports to early childhood educators in order to increase their competence in nurturing social-emotional development in young children. Our PMP Leadership Team recently changed its name to Early Childhood Social Emotional Team and broadened its scope of responsibilities to include the oversight of MECC’s Social Emotional Strategic Plan. MECC sponsored a part-time Early Childhood Mental Health Consultant to assist early childhood settings address challenging behaviors and prevent expulsion for about three years, however, the funding for this initiative ended 6/30/13. We are continuing to seek resources to resume and sustain this important program.